DEWALT FLEXVOLT High Efficiency Accessories are engineered to maximize runtime. The hole saws feature a self-feed pilot bit for fast, efficient cutting, carbide teeth for long life, and a thin Kerf design for high efficiency. For use in cordless and corded tools. The DEWALT DWAFV03 Hole Saw is 3inches in diameter. This new 9-piece carbide, high performance hole saw set delivers faster cutting performance and increased productivity versus standard bi-metal hole saws. Unlike anything on the market, Diablo's hole saws and SnapLock Plus mandrel system simplify the attachment process for fast and efficient hole saw mounting. These radical new hole saws provide ultimate cutting length to bore deeper holes in a single pass, tool-free plug ejection and Variable Tooth Design for faster cuts. 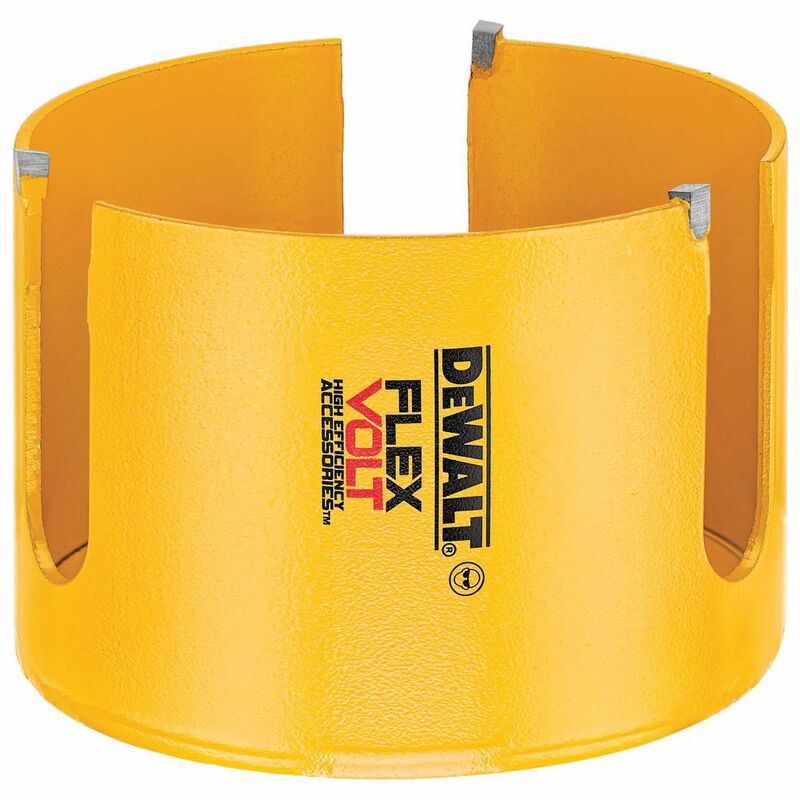 FLEXVOLT 3 Inch Carbide Wood Hole Saw DEWALT FLEXVOLT High Efficiency Accessories are engineered to maximize runtime. The hole saws feature a self-feed pilot bit for fast, efficient cutting, carbide teeth for long life, and a thin Kerf design for high efficiency. For use in cordless and corded tools. The DEWALT DWAFV03 Hole Saw is 3inches in diameter. FLEXVOLT 3 Inch Carbide Wood Hole Saw is rated 4.5 out of 5 by 2.